At June 30, 2017, the aggregate market value of the registrant’s voting stock held by non-affiliates of the registrant was $1.61 billion. At February 16, 2018 there were 154,235,814 shares of the registrant’s common stock outstanding. Certain information called for by Items 10, 11, 12, 13 and 14 of Part III is incorporated by reference from the registrant’s definitive proxy statement to be filed pursuant to Regulation 14A. This Annual Report on Form 10-K and other documents filed by us with the Securities and Exchange Commission (SEC) contain, and future oral or written statements or press releases by us and our management may contain, forward-looking statements within the safe harbor provisions of the Private Securities Litigation Reform Act of 1995. Generally, the words “expects,” “anticipates,” “targets,” “goals,” “projects,” “intends,” “plans,” “believes,” “seeks” and “estimates,” variations of such words and similar expressions identify forward-looking statements, although not all forward-looking statements contain these identifying words. All statements other than statements of historical fact included in this Annual Report on Form 10-K or such other materials regarding our financial position, financial performance, liquidity, strategic alternatives, market outlook, future capital needs, capital allocation plans, business strategies and other plans and objectives of our management for future operations and activities are forward-looking statements. These statements are based on certain assumptions and analyses made by our management in light of its experience and prevailing circumstances on the date such statements are made. Such forward-looking statements, and the assumptions on which they are based, are inherently speculative and are subject to a number of risks and uncertainties that could cause our actual results to differ materially from such statements. Such uncertainties include, but are not limited to: the cyclicality and volatility of the oil and gas industry, including changes in prevailing oil and gas prices or expectations about future prices; operating hazards, including the significant possibility of accidents resulting in personal injury or death, property damage or environmental damage for which we may have limited or no insurance coverage or indemnification rights; the effect of regulatory programs (including regarding worker health and safety laws) and environmental matters on our operations or prospects, including the risk that future changes in the regulation of hydraulic fracturing could reduce or eliminate demand for our pressure pumping services, or that future changes in climate change legislation could result in increased operating costs or reduced commodity demand globally; counterparty risks associated with reliance on key suppliers; risks associated with the uncertainty of macroeconomic and business conditions worldwide; changes in competitive and technological factors affecting our operations; credit risk associated with our customer base; the potential inability to retain key employees and skilled workers; challenges with estimating our oil and natural gas reserves and potential liabilities related to our oil and natural gas property; risks associated with potential changes of Bureau of Ocean Energy Management (BOEM) security and bonding requirements for offshore platforms; risks inherent in acquiring businesses; risks associated with cyber-attacks; risks associated with business growth during an industry recovery outpacing the capabilities of our infrastructure and workforce; political, legal, economic and other risks and uncertainties associated with our international operations; potential changes in tax laws, adverse positions taken by tax authorities or tax audits impacting our operating results; risks associated with our outstanding debt obligations and the potential effect of limiting our future growth and operations our continued access to credit markets on favorable terms; and the impact that unfavorable or unusual weather conditions could have on our operations. These risks and other uncertainties related to our business are described in detail below in Part I, Item 1A of this Annual Report on Form 10-K. Although we believe that the expectations reflected in such forward-looking statements are reasonable, we can give no assurance that such expectations will prove to be correct. Investors are cautioned that many of the assumptions on which our forward-looking statements are based are likely to change after such statements are made, including for example the market prices of oil and gas and regulations affecting oil and gas operations, which we cannot control or anticipate. Further, we may make changes to our business strategies and plans (including our capital spending and capital allocation plans) at any time and without notice, based on any changes in the above-listed factors, our assumptions or otherwise, any of which could or will affect our results. For all these reasons, actual events and results may differ materially from those anticipated, estimated, projected or implied by us in our forward-looking statements. We undertake no obligation to update any of our forward-looking statements for any reason and, notwithstanding any changes in our assumptions, changes in our business plans, our actual experience, or other changes. You are cautioned not to place undue reliance on these forward-looking statements, which speak only as of the date hereof. We provide a wide variety of services and products to the energy industry. We serve major, national and independent oil and natural gas exploration and production companies around the world and we offer products and services with respect to the various phases of a well’s economic life cycle. We report our operating results in four business segments: Drilling Products and Services; Onshore Completion and Workover Services; Production Services; and Technical Solutions. Given our long-term strategy of geographic expansion, we also provide supplemental segment revenue information in three geographic areas: U.S. land; Gulf of Mexico; and International. For information about our operating segments and financial information by operating segment and geographic area, refer to “Management’s Discussion and Analysis of Financial Condition and Results of Operations” included in Part II, Item 7 of this Annual Report on Form 10-K and note 8 to our consolidated financial statements included in Part II, Item 8 of this Annual Report on Form 10-K.
Drilling Products and Services – Includes downhole drilling tools and surface rentals. Downhole drilling tools – Includes rentals of tubulars, such as primary drill pipe strings, landing strings, completion tubulars and associated accessories, and manufacturing and rentals of bottom hole tools, including stabilizers, non-magnetic drill collars and hole openers. Surface rentals – Includes rentals of temporary onshore and offshore accommodation modules and accessories. Onshore Completion and Workover Services – Includes pressure pumping, fluid handling and workover and maintenance services. Pressure pumping – Includes hydraulic fracturing and high pressure pumping services used to complete and stimulate production in new oil and gas wells. Fluid management – Includes services used to obtain, move, store and dispose of fluids that are involved in the exploration, development and production of oil and gas, including specialized trucks, fracturing tanks and other assets that transport, heat, pump and dispose of fluids. Workover services – Includes a variety of well completion, workover and maintenance services, including installations, completions, sidetracking of wells and support for perforating operations. Production Services – Includes intervention services. Intervention services – Includes services to enhance, maintain and extend oil and gas production during the life of the well, including coiled tubing, cased hole and mechanical wireline, hydraulic workover and snubbing, production testing and optimization, and remedial pumping services (cementing and stimulation services). Technical Solutions – Includes products and services that generally address customer-specific needs with their applications, which typically require specialized engineering, manufacturing or project planning expertise. Most operations requiring our technical solutions are generally in offshore environments during the completion, production and decommissioning phase of an oil and gas well. These products and services primarily include well containment systems, completion tools and services and end-of-life services. Well containment systems – Resolves well control and pressure control problems through firefighting, engineering and well control training. Completion tools and services – Provides products and services used during the completion phase of an offshore well to control sand and maximize oil and gas production, including sand control systems, well screens and filters, and surface-controlled sub surface safety valves. End-of-life services – Provides offshore well decommissioning services, including plugging and abandoning wells at the end of their economic life and dismantling and removing associated infrastructure. The Technical Solutions segment also includes revenues from oil and gas production related to our 51% ownership interest in the Bullwinkle platform and related assets. Our customers are the major and independent oil and gas companies that are active in the geographic areas in which we operate. Anadarko Petroleum Corporation (Anadarko) accounted for approximately 13% and 11% of our revenues in 2017 and 2016, respectively, primarily within the Onshore Completion and Workover Services segment. There were no customers that exceeded 10% of our total revenues in 2015. Our inability to continue to perform services for a number of our large existing customers, if not offset by sales to new or other existing customers, could have a material adverse effect on our business and operations. We provide products and services worldwide in highly competitive markets, with competitors comprised of both small and large companies. Our revenues and earnings can be affected by several factors, including changes in competition, fluctuations in drilling and completion activity, perceptions of future prices of oil and gas, government regulation, disruptions caused by weather and general economic conditions. We believe that the principal competitive factors are price, performance, product and service quality, safety, response time and breadth of products and services. Our operations involve a high degree of operational risk and expose us to significant liabilities. An accident involving our services or equipment, or the failure of a product sold by us, could result in personal injury, loss of life, and damage to property, equipment or the environment. Litigation arising from a catastrophic occurrence, such as fire, explosion, well blowout or vessel loss, may result in substantial claims for damages. As is customary in our industry, our contracts generally provide that we will indemnify and hold harmless our customers from any claims arising from personal injury or death of our employees, damage to or loss of our equipment, and pollution emanating from our equipment and services. Similarly, our customers generally agree to indemnify and hold us harmless from any claims arising from personal injury or death of their employees, damage to or loss of their equipment or property, and pollution caused from their equipment or the well reservoir (including uncontained oil flow from a reservoir). Nonetheless, our indemnification arrangements may not protect us in every case. We maintain a liability insurance program that covers against certain operating hazards, including product liability, property damage and personal injury claims, as well as certain limited environmental pollution claims for damage to a third party or its property arising out of contact with pollution for which we are liable, but well control costs are not covered by this program. These policies include primary and excess umbrella liability policies with limits of $350 million per occurrence, including sudden and accidental pollution incidents. All of the insurance policies purchased by us contain specific terms, conditions, limitations and exclusions and are subject to either deductibles or self-insured retention amounts for which we are responsible. There can be no assurance that the nature and amount of insurance we maintain will be sufficient to fully protect us against all liabilities related to our business. the mobilization of our equipment to, and operations conducted at, our work sites. Numerous permits are required for the conduct of our business and operation of our various facilities and equipment, including our underground injection wells, marine vessels, trucks and other heavy equipment. These permits can be revoked, modified or renewed by issuing authorities based on factors both within and outside our control. We cannot predict the level of enforcement of existing laws and regulations or how such laws and regulations may be interpreted by enforcement agencies or court rulings in the future. We also cannot predict whether additional laws and regulations will be adopted, including changes in regulatory oversight, increase of federal, state or local taxes, increase of inspection costs, or the effect such changes may have on us, our businesses or our financial condition. Our operations, and those of our customers, are subject to extensive laws, regulations and treaties relating to air and water quality, generation, storage and handling of hazardous materials, and emission and discharge of materials into the environment. We believe we are in substantial compliance with all regulations affecting our business. Historically, our expenditures in furtherance of our compliance with these laws, regulations and treaties have not been material, and we do not expect the cost of compliance to be material in the future. We purchase various raw materials and component parts in connection with delivering our products and services. These materials are generally, but not always, available from multiple sources and may be subject to price volatility. While we generally do not experience significant long-term shortages of these materials, we have from time to time experienced temporary shortages of particular raw materials. We are always seeking ways to ensure the availability of resources, as well as manage costs of raw materials. Seasonal weather and severe weather conditions can temporarily impair our operations and reduce demand for our products and services. Examples of seasonal events that negatively affect our operations include high seas associated with cold fronts during the winter months and hurricanes during the summer months in the Gulf of Mexico, and severe cold during winter months in the U.S. land market area. At December 31, 2017, we had approximately 6,400 employees. Approximately 10% of our employees are subject to union contracts, all of which are in international locations. We believe that we have good relationships with our employees. Our principal executive offices are located at 1001 Louisiana Street, Suite 2900, Houston, Texas, 77002. We own or lease a large number of facilities in the various areas in which we operate throughout the world. We seek patent and trademark protections throughout the world for our technology when we deem it prudent, and we aggressively pursue protection of these rights. We believe our patents and trademarks are adequate for the conduct of our business, and that no single patent or trademark is critical to our business. In addition, we rely to a great extent on the technical expertise and know-how of our personnel to maintain our competitive position. We have our principal executive offices at 1001 Louisiana Street, Suite 2900, Houston, Texas 77002. Our telephone number is (713) 654-2200. We also have a website at http://www.superiorenergy.com. Copies of the annual, quarterly and current reports we file with the SEC, and any amendments to those reports, are available on our website free of charge soon after such reports are filed with or furnished to the SEC. The information posted on our website is not incorporated into this Annual Report on Form 10-K. Alternatively, you may access these reports at the SEC’s website at http://www.sec.gov/. We have a Code of Conduct (Our Shared Core Values at Work), which applies to all of our directors, officers and employees. This Code of Conduct is publicly available on the Corporate Governance page in the About Us section of our website at http://www.superiorenergy.com. Any waivers granted to directors or executive officers and any material amendment to our Code of Conduct will be posted promptly on our website and/or disclosed in a current report on Form 8-K.
Investors should be aware that while we do, at various times, communicate with securities analysts, it is against our policy to disclose to them selectively any material non-public information or other confidential information. Accordingly, investors should not assume that we agree with any statement or report issued by an analyst with respect to our past or projected performance. To the extent that reports issued by securities analysts contain any projections, forecasts or opinions, such reports are not our responsibility. The following information should be read in conjunction with management’s discussion and analysis of financial condition and results of operations contained in Part II, Item 7 and the consolidated financial statements and related notes contained in Part II, Item 8 of this Annual Report on Form 10-K, as well as in conjunction with the matters contained under the caption “Forward-Looking Statements” at the beginning of this Annual Report on Form 10-K.
Our business depends on conditions in the oil and gas industry, especially oil and natural gas prices and capital expenditures by oil and gas companies. Our business depends on the level of oil and natural gas exploration, development and production activity by oil and gas companies worldwide. The level of exploration, development and production activity is directly affected by trends in oil and natural gas prices, which historically have been volatile and difficult to predict. Oil and natural gas prices are subject to large fluctuations in response to relatively minor changes in supply and demand, economic growth trends, market uncertainty and a variety of other factors beyond our control. Lower oil and natural gas prices generally lead to decreased spending by our customers. While higher oil and natural gas prices generally lead to increased spending by our customers, sustained high energy prices can also be an impediment to economic growth and can therefore negatively impact spending by our customers. Our customers may also take into account the volatility of energy prices and other risk factors by requiring higher returns for individual projects if there is higher perceived risk. Any of these factors could significantly affect the demand for oil and natural gas, which could affect the level of capital spending by our customers and in turn could have a material effect on our results of operations. The availability of quality drilling prospects, exploration success, relative production costs, expectations about future oil and natural gas demand and prices, the stage of reservoir development, the availability of financing, and political and regulatory environments are also expected to affect levels of exploration, development, and production activity, which would impact the demand for our services. Any prolonged reduction of oil and natural gas prices, as well as anticipated declines, could also result in lower levels of exploration, development, and production activity. technological advances affecting energy exploration, production and consumption. The oil and gas industry has historically experienced periodic downturns, which have been characterized by significantly reduced demand for oilfield services and downward pressure on the prices we charge. Moreover, weakness in the oil and gas industry may adversely impact the financial position of our customers, which in turn could cause them to fail to pay amounts owed to us in a timely manner or at all. Any of these events could have a material adverse effect on our business, results of operations, financial condition and prospects. We have outstanding debt obligations that could limit our ability to fund future growth and operations and increase our exposure to risk during adverse economic conditions. At December 31, 2017, we had $1.3 billion in outstanding debt obligations. Many factors, including factors beyond our control, may affect our ability to make payments on our outstanding indebtedness. These factors include those discussed elsewhere in these Risk Factors and those listed in the “Forward-Looking Statements” section included in this Annual Report on Form 10-K.
limit our ability to refinance our debt in the future or borrow additional funds. There are operating hazards inherent in the oil and gas industry that could expose us to substantial liabilities. Our operations are subject to hazards inherent in the oil and gas industry that may lead to property damage, personal injury, death or the discharge of hazardous materials into the environment. Many of these events are outside of our control. Typically, we provide products and services at a well site where our personnel and equipment are located together with personnel and equipment of our customer and other service providers. From time to time, personnel are injured or equipment or property is damaged or destroyed as a result of accidents, failed equipment, faulty products or services, failure of safety measures, uncontained formation pressures or other dangers inherent in oil and natural gas exploration, development and production. Any of these events can be the result of human error or purely accidental, and it may be difficult or impossible to definitively determine the ultimate cause of the event or whose personnel or equipment contributed thereto. All of these risks expose us to a wide range of significant health, safety and environmental risks and potentially substantial litigation claims for damages. With increasing frequency, our products and services are deployed in more challenging exploration, development and production locations. From time to time, customers and third parties may seek to hold us accountable for damages and costs incurred as a result of an accident, including pollution, even under circumstances where we believe we did not cause or contribute to the accident. Our insurance policies are subject to exclusions, limitations and other conditions, and may not protect us against liability for some types of events, including events involving a well blowout, or against losses from business interruption. Moreover, we may not be able to maintain insurance at levels of risk coverage or policy limits that we deem adequate or on terms that we deem commercially reasonable. Any damages or losses that are not covered by insurance, or are in excess of policy limits or subject to substantial deductibles or retentions, could adversely affect our financial condition, results of operations and cash flows. We may not be fully indemnified against losses incurred due to catastrophic events. As is customary in our industry, our contracts generally provide that we will indemnify and hold harmless our customers from any claims arising from personal injury or death of our employees, damage to or loss of our equipment, and pollution emanating from our equipment and services. Similarly, our customers generally agree to indemnify and hold us harmless from any claims arising from personal injury or death of their employees, damage to or loss of their equipment or property, and pollution caused from their equipment or the well reservoir (including uncontained oil flow from a reservoir). Our indemnification arrangements may not protect us in every case. For example, from time to time we may enter into contracts with less favorable indemnities or perform work without a contract that protects us. In addition, our indemnification rights may not fully protect us if we cannot prove that we are entitled to be indemnified or if the customer is bankrupt or insolvent, does not maintain adequate insurance or otherwise does not possess sufficient resources to indemnify us. In addition, our indemnification rights may be held unenforceable in some jurisdictions. Our customers’ changing views on risk allocation could cause us to accept greater risk to win new business or could result in us losing business if we are not prepared to take such risks. To the extent that we accept such additional risk, and insure against it, our insurance premiums could rise. From time to time, we are subject to various claims, litigation and other proceedings that could ultimately be resolved against us, requiring material future cash payments or charges, which could impair our financial condition or results of operations. The size, nature and complexity of our business make us susceptible to various claims, both in litigation and binding arbitration proceedings. We may in the future become subject to various claims, which, if not resolved within amounts we have accrued, could have a material adverse effect on our financial position, results of operations or cash flows. Similarly, any claims, even if fully indemnified or insured, could negatively impact our reputation among our customers and the public, and make it more difficult for us to compete effectively or obtain adequate insurance in the future. The credit risks of our customer base could result in losses. Many of our customers are oil and gas companies that are facing liquidity constraints in light of the current commodity price environment. These customers impact our overall exposure to credit risk as they are also affected by prolonged changes in economic and industry conditions. If a significant number of our customers experience a prolonged business decline or disruptions, we may incur increased exposure to credit risk and bad debts. Increased regulation of or limiting or banning hydraulic fracturing and wastewater disposal could reduce or eliminate demand for our pressure pumping and fluid management services. Our customers rely on hydraulic fracturing in conducting exploration and production operations. Hydraulic fracturing is typically regulated by state oil and gas commissions and similar agencies. However, the practice of hydraulically fracturing formations to stimulate the production of natural gas and oil remains under increased scrutiny from federal, state and local governmental authorities. Various federal legislative and regulatory initiatives have been undertaken which could result in additional requirements or restrictions being imposed on hydraulic fracturing operations. Federal agencies, including the Environmental Protection Agency (EPA) and Bureau of Land Management (BLM), have asserted regulatory authority over certain aspects of hydraulic fracturing within their specific jurisdiction. For example, the EPA has issued an Advance Notice of Proposed Rulemaking to collect data on chemicals used in hydraulic fracturing operations under Section 8 of the Toxic Substances Control Act, and has enacted, and recently proposed additional New Source Performance Standards for certain aspects of the hydraulic fracturing process. From time to time, Congress has considered legislative measures to regulate hydraulic fracturing, including the imposition of chemical disclosure and permitting requirements. At the state level, several states have adopted or are considering legal requirements that could impose more stringent permitting, disclosure, and well construction requirements on hydraulic fracturing activities. Local governments may also seek to adopt ordinances within their jurisdictions regulating the time, place and manner of, or prohibiting the performance of, drilling activities in general or hydraulic fracturing activities in particular. oil and natural gas wastewater injected into the ground in an effort to reduce the number of earthquakes in the state. The Texas Railroad Commission adopted similar rules in 2014. Furthermore, ongoing lawsuits allege that disposal well operations have caused damage to neighboring properties or otherwise violated state and federal rules regulating waste disposal. These developments could result in additional regulation and restrictions on the use of injection wells. Increased regulation and attention given to induced seismicity could lead to greater opposition to oil and gas activities utilizing injection wells for waste disposal. The adoption of additional legislation or regulation could impose further requirements or limitations, such as restrictions on the use of certain chemicals or prohibitions on hydraulic fracturing and disposal of wastewater in certain areas, which could impact our and our customers operations, and demand for our services. Adverse and unusual weather conditions may affect our operations. Our operations may be materially affected by severe weather conditions in areas where we operate. Severe weather, such as hurricanes, high winds and seas, blizzards and extreme temperatures may cause evacuation of personnel, curtailment of services and suspension of operations, inability to deliver materials to jobsites in accordance with contract schedules, loss of or damage to equipment and facilities and reduced productivity. In addition, variations from normal weather patterns can have a significant impact on demand for oil and natural gas, thereby reducing demand for our services and equipment. Necessary capital financing may not be available at economic rates or at all. Turmoil in the credit and financial markets could adversely affect financial institutions, inhibit lending and limit our access to funding through borrowings under our credit facility or newly created facilities in the public or private capital markets on terms we believe to be reasonable. Prevailing market conditions could be adversely affected by the ongoing disruptions in domestic or overseas sovereign or corporate debt markets, low commodity prices or other factors impacting our business, contractions or limited growth in the economy or other similar adverse economic developments in the U.S. or abroad. Instability in the global financial markets has from time to time resulted in periodic volatility in the capital markets. This volatility could limit our access to the credit markets, leading to higher borrowing costs or, in some cases, the inability to obtain financing on terms that are acceptable to us, or at all. Any such failure to obtain additional financing could jeopardize our ability to repay, refinance or reduce our debt obligations, or to meet our other financial commitments. Our inability to retain key employees and skilled workers could adversely affect our operations. Our performance could be adversely affected if we are unable to retain certain key employees and skilled technical personnel. Our ability to continue to expand the scope of our services and products depends in part on our ability to increase the size of our skilled labor force. The loss of the services of one or more of our key employees or the inability to employ or retain skilled technical personnel could adversely affect our operating results. In the past, the demand for skilled personnel has been high and the supply limited. We have experienced increases in labor costs in recent years and may continue to do so in the future. Our international operations and revenue are affected by political, economic and other uncertainties worldwide. In 2017, we conducted business in more than 50 countries, and we intend to expand our international operations. Our international operations are subject to varying degrees of regulation in each of the foreign jurisdictions in which we provide services. Local laws and regulations, and their interpretation and enforcement, differ significantly among those jurisdictions, and can change significantly over time. Future regulatory, judicial and legislative changes or interpretations may have a material adverse effect on our ability to deliver services within various foreign jurisdictions. challenges in staffing and managing international operations. These and the other risks outlined above could cause us to curtail or terminate operations, result in the loss of personnel or assets, disrupt financial and commercial markets and generate greater political and economic instability in some of the geographic areas in which we operate. International areas where we operate that have significant risk include the Middle East, Angola, Colombia, Indonesia and Nigeria. Laws, regulations or practices in foreign countries could materially restrict our operations or expose us to additional risks. In many countries around the world where we do business, all or a significant portion of the decision making regarding procuring our services and products is controlled by state-owned oil companies. State-owned oil companies or prevailing laws may (i) require us to meet local content or hiring requirements or other local standards, (ii) restrict with whom we can contract or (iii) otherwise limit the scope of operations that we can legally or practically conduct. Our inability or failure to meet these requirements, standards or restrictions may adversely impact our operations in those countries. In addition, our ability to work with state-owned oil companies is subject to our ability to negotiate and agree upon acceptable contract terms, and to enforce those terms. In addition, many state-owned oil companies may require integrated contracts or turnkey contracts that could require us to provide services outside our core businesses. Providing services on an integrated or turnkey basis generally requires us to assume additional risks. laws for actions taken by our strategic or local contractors, partners or agents even though these contractors, partners or agents may not themselves be subject to the FCPA or other applicable anti-corruption laws. Any determination that we have violated the FCPA or other anti-corruption laws could have a material adverse effect on our business, results of operations, reputation or prospects. Changes in tax laws or tax rates, adverse positions taken by taxing authorities and tax audits could impact our operating results. We are subject to the jurisdiction of a significant number of domestic and foreign taxing authorities. Changes in tax laws or tax rates, the resolution of tax assessments or audits by various tax authorities could impact our operating results. In addition, we may periodically restructure our legal entity organization. If taxing authorities were to disagree with our tax positions in connection with any such restructurings, our effective income tax rate could be impacted. The final determination of our income tax liabilities involves the interpretation of local tax laws, tax treaties and related authorities in each taxing jurisdiction, as well as the significant use of estimates and assumptions regarding future operations and results and the timing of income and expenses. We may be audited and receive tax assessments from taxing authorities that may result in assessment of additional taxes that are ultimately resolved with the authorities or through the courts. We believe these assessments may occasionally be based on erroneous and even arbitrary interpretations of local tax law. Resolution of any tax matter involves uncertainties and there are no assurances that the outcomes will be favorable. The U.S. recently enacted significant tax reform, and certain provisions of the new law may adversely affect us. If U.S. or other foreign tax authorities change applicable tax laws, our overall taxes could increase, and our business, financial condition or results of operating may be adversely impacted. We are subject to environmental, worker health and safety laws and regulations, which could reduce our business opportunities and revenue, and increase our costs and liabilities. Our business is significantly affected by a wide range of environmental and worker health and safety laws and regulations in the areas in which we operate, including increasingly rigorous environmental laws and regulations governing air emissions, water discharges and waste management. Generally, these laws and regulations have become more stringent and have sought to impose greater liability on a larger number of potentially responsible parties. The Macondo well explosion in 2010 resulted in additional regulation of our offshore operations, and similar onshore or offshore accidents in the future could result in additional increases in regulation. Failure to comply with these laws and regulations may result in a variety of administrative, civil and criminal enforcement measures, including assessment of monetary penalties, imposition of remedial requirements and issuance of injunctions as to future compliance. Environmental laws and regulations may provide for “strict liability” for remediation costs, damages to natural resources or threats to public health and safety as a result of our conduct that was lawful at the time it occurred or the conduct of, or conditions caused by, prior owners or operators or other third parties. Strict liability can render a party liable for damages without regard to negligence or fault on the part of the party. Some environmental laws provide for joint and several strict liability for remediation of spills and releases of hazardous substances. For example, our well service and fluids businesses routinely involve the handling of significant amounts of waste materials, some of which are classified as hazardous substances. We also store, transport and use radioactive and explosive materials in certain of our operations. In addition, many of our current and former facilities are, or have been, used for industrial purposes. Accordingly, we could become subject to material liabilities relating to the containment and disposal of hazardous substances, oilfield waste and other waste materials, the use of radioactive materials, the use of underground injection wells, and to claims alleging personal injury or property damage as the result of exposures to, or releases of, hazardous substances. In addition, stricter enforcement of existing laws and regulations, new domestic or foreign laws and regulations, the discovery of previously unknown contamination or the imposition of new or increased requirements could require us to incur costs or become the basis of new or increased liabilities that could reduce our earnings and our cash available for operations. In addition, we and our customers may need to apply for or amend facility permits or licenses from time to time with respect to storm water or wastewater discharges, waste handling, or air emissions relating to manufacturing activities or equipment operations, which subjects us and our customers to new or revised permitting conditions that may be onerous or costly to comply with. Climate change legislation or regulations restricting emissions of greenhouse gases (GHGs) could result in increased operating costs and reduced demand for the oil and natural gas our customers produce. Increasing concerns that emissions of carbon dioxide, methane and other greenhouse gases (GHGs) may endanger public health and produce climate changes with significant physical effects, such as increased frequency and severity of storms, floods, droughts and other climatic events, have drawn significant attention from government agencies and environmental advocacy groups. In response, additional costly requirements and restrictions have been imposed on the oil and gas industry to regulate and reduce the emission of GHG’s. GHG emissions inventories and through cap and trade programs that typically require major sources of GHG emissions to acquire and surrender emission allowances in return for emitting GHGs. Given the long-term trend towards increasing regulation, future federal GHG regulations of the oil and gas industry remain a possibility. Additionally, in December 2015, the United States joined the international community at the 21st Conference of the Parties of the United Nations Framework Convention on Climate Change in Paris, France that proposed an agreement requiring member countries to review and “represent a progression” in their intended nationally determined contributions, which set GHG emission reduction goals every five years beginning in 2020. This agreement was signed by the United States in April 2016 and entered into force in November 2016. The United States is one of over 120 nations having ratified or otherwise consented to the agreement; however this agreement does not create any binding obligations for nations to limit their GHG emissions, but rather includes pledges to voluntarily limit or reduce future emissions. In June 2017, President Trump announced that the United States intends to withdraw from the Paris Agreement and to seek negotiations either to reenter the Paris Agreement on different terms or a separate agreement. In August 2017, the U.S. Department of State officially informed the United Nations of the intent of the United States to withdraw from the Paris Agreement. The Paris Agreement provides for a four-year exit process beginning when it took effect in November 2016, which would result in an effective exit date of November 2020. The United States’ adherence to the exit process and/or the terms on which the United States may re-enter the Paris Agreement or a separately negotiated agreement are unclear at this time. In addition to governmental regulations, our customers are also requiring additional equipment upgrades to address the growing concerns of GHG emission and climate change which result in higher operational costs for service providers such as us. Despite taking additional measures to reduce GHG emissions, there is the possibility that the demand for fossil fuels may nevertheless decrease due to such concerns. At this stage, we cannot predict the impact of these or other initiatives on our or our customers operations, nor can we predict whether, or which of, other currently pending greenhouse gas emission proposals will be adopted, or what other actions may be taken by domestic or international regulatory bodies. The potential passage of climate change regulation may curtail production and demand for fossil fuels such as oil and gas in areas of the world where our customers operate and thus adversely affect future demand for our products and services, which may in turn adversely affect future results of operations. If we are not able to design, develop, and produce commercially competitive products and to implement commercially competitive services in a timely manner in response to changes in the market, customer requirements, competitive pressures, and technology trends, our business and results of operations could be materially and adversely affected. The market for our services and products is characterized by continual technological developments to provide better and more reliable performance and services. If we are not able to design, develop, and produce commercially competitive products and to implement commercially competitive services in a timely manner in response to changes in the market, customer requirements, competitive pressures, and technology trends, our business and consolidated results of operations could be materially and adversely affected. Likewise, if our proprietary technologies, equipment, facilities, or work processes become obsolete, we may no longer be competitive, and our business and results of operations could be materially and adversely affected. In addition, we may be disadvantaged competitively and financially by a significant movement of exploration and production operations to areas of the world in which we are not currently active. We are affected by global economic factors and political events. Our financial results depend on demand for our services and products in the U.S. and the international markets in which we operate. Declining economic conditions, or negative perceptions about economic conditions, could result in a substantial decrease in demand for our services and products. World political events could also result in further U.S. military actions, terrorist attacks and related unrest. Military action by the U.S. or other nations could escalate and further acts of terrorism may occur in the U.S. or elsewhere. Such acts of terrorism could lead to, among other things, a loss of our investment in the country, impairment of the safety of our employees, extortion or kidnapping, and impairment of our ability to conduct our operations. Such developments have caused instability in the world’s financial and insurance markets in the past, and many experts believe that a confluence of worldwide factors could result in a prolonged period of economic uncertainty and slow growth in the future. In addition, any of these developments could lead to increased volatility in prices for oil and gas and could affect the markets for our products and services. Insurance premiums could also increase and coverages may be unavailable. Uncertain economic conditions and instability make it particularly difficult for us to forecast demand trends. The timing and extent of any changes to currently prevailing market conditions is uncertain and may affect demand for many of our services and products. Consequently, we may not be able to accurately predict future economic conditions or the effect of such conditions on demand for our services and products and our results of operations or financial condition. We may not realize the anticipated benefits of acquisitions or divestitures. We continually seek opportunities to increase efficiency and value through various transactions, including purchases or sales of assets or businesses. These transactions are intended to result in the offering of new services or products, the entry into new markets, the generation of income or cash, the creation of efficiencies or the reduction of risk. Whether we realize the anticipated benefits from an acquisition or any other transactions depends, in part, upon our ability to timely and efficiently integrate the operations of the acquired business, the performance of the underlying product and service portfolio, and the management team and other personnel of the acquired operations. Accordingly, our financial results could be adversely affected from unanticipated performance issues, legacy liabilities, transaction-related charges, amortization of expenses related to intangibles, charges for impairment of long-term assets, credit guarantees, partner performance and indemnifications. In addition, the financing of any future acquisition completed by us could adversely impact our capital structure or increase our leverage. While we believe that we have established appropriate and adequate procedures and processes to mitigate these risks, there is no assurance that these transactions will be successful. We also may make strategic divestitures from time to time. These transactions may result in continued financial involvement in the divested businesses, such as guarantees or other financial arrangements, following the transaction. Nonperformance by those divested businesses could affect our future financial results through additional payment obligations, higher costs or asset write-downs. Except as required by law or applicable securities exchange listing standards, we do not expect to ask our shareholders to vote on any proposed acquisition or divestiture. Moreover, we generally do not announce our acquisitions or divestitures until we have entered into a preliminary or definitive agreement. We depend on particular suppliers and are vulnerable to product shortages and price increases. Some of the materials that we use are obtained from a limited group of suppliers. Our reliance on these suppliers involves several risks, including price increases, inferior quality and a potential inability to obtain an adequate supply in a timely manner. We do not have long-term contracts with most of these sources, and the partial or complete loss of certain of these sources could have a negative impact on our results of operations and could damage our customer relationships. Further, a significant increase in the price of one or more of these materials could have a negative impact on our results of operations. Estimates of our oil and natural gas reserves and potential liabilities relating to our oil and natural gas property may be incorrect. Actual future production, cash flows, development expenditures, operating and abandonment expenses and quantities of recoverable oil and natural gas reserves may vary substantially from those estimated by us and any significant variance in these assumptions could materially affect the estimated quantity and value of our proved reserves. Therefore, the risk exists we may overestimate the value of economically recoverable reserves or underestimate the cost of plugging wells and abandoning production facilities. If costs of abandonment are materially greater or actual reserves are materially lower than our estimates, this could have an adverse effect on our financial condition, results of operations and cash flows. Potential changes of Bureau of Ocean Energy Management security and bonding requirements for offshore platforms could impact our operating cash flows and results of operations. implementation timeline for properties with co-lessees by an additional six months, and in June 2017 announced that the Notice to lessees would be stayed while BOEM continued to review its implementation issues and continued industry engagement to gather additional information on the financial assurance program. We cannot predict whether these laws and regulations may change in the future, particularly in connection with the transition of presidential administrations. During the second half of 2016, BSEE increased its estimates of many offshore operator’s decommissioning costs, including the decommissioning costs at our sole federal offshore oil and gas property, Bullwinkle. Our subsidiary owns a 51% non-operating interest in Bullwinkle. In October 2016, BOEM sent an initial proposal letter to the operator of Bullwinkle, proposing an increase in the supplemental bonding requirement for the property’s sole fixed platform that was eight to ten times higher than the revised supplemental bonding requirement requested for any other deep-water fixed platform in the U.S. Gulf of Mexico. Both the operator and our subsidiary submitted formal dispute notices, asserting that the estimates in the October 2016 proposal letter may be based on erroneous or arbitrary estimates of the potential decommissioning costs, and requesting in-person meetings to discuss the estimate. We asked that BSEE and BOEM reduce the estimate to an amount that more closely approximates actual decommissioning costs, consistent with estimates identified by BSEE and BOEM for similar deep-water platforms. BSEE and BOEM have not yet responded to our dispute notice. If BOEM ultimately issues a formal order and we are unable to obtain the additional required bonds or assurances, BOEM may suspend or cancel operations at the Bullwinkle Platform or otherwise impose monetary penalties. Any of these actions could have a material effect on our financial condition, operating cash flows and liquidity. Business growth could outpace the capabilities of our infrastructure and workforce. We cannot be certain that our infrastructure and workforce will be adequate to support our operations as we expand in the future. Future growth also could impose significant additional demands on our resources, resulting in additional responsibilities of our senior management, including the need to recruit and integrate new senior level managers, executives and operating personnel. We cannot be certain that we will be able to recruit and retain such additional personnel. Moreover, we may need to expend significant time and money in the future to integrate and unify our systems and infrastructure. To the extent that we are unable to manage our growth effectively, or are unable to attract and retain additional qualified personnel, we may not be able to expand our operations or execute our business plan. Some of the factors that could affect the price of our common stock are quarterly increases or decreases in revenue or earnings, changes in revenue or earnings estimates by the investment community and speculation in the press or investment community about our financial condition or results of operations. General market conditions and U.S. or international economic factors and political events unrelated to our performance may also affect our stock price. For these reasons, investors should not rely on recent trends in the price of our common stock to predict the future price of our common stock or our financial results. Information on properties is contained in Part I, Item 1 of this Annual Report on Form 10-K.
From time to time, we are involved in various legal actions incidental to our business. The outcome of these proceedings is not predictable. However, based on current circumstances, we do not believe that the ultimate resolution of these proceedings, after considering available defenses and any insurance coverage or indemnification rights, will have a material adverse effect on our financial position, results of operations or cash flows. Our common stock trades on the New York Stock Exchange under the symbol “SPN.” The following table sets forth the high and low sales prices per share of common stock as reported for each fiscal quarter during the periods indicated. At February 16, 2018, there were 154,235,814 shares of our common stock outstanding, which were held by 115 record holders. On March 31, 2016, our Board of Directors announced that, following a recommendation of the Company's management team, it approved the elimination of the Company's quarterly dividend. In addition, our credit agreement restricts the payment of dividends. Information required by this item with respect to compensation plans under which our equity securities are authorized for issuance is incorporated by reference from Part III, Item 12 of this Annual Report Form 10-K, which will be contained in our definitive proxy statement to be filed pursuant to Regulation 14A and is incorporated herein by reference. There were no repurchases of our equity securities during the quarter ended December 31, 2017. The following performance graph and related information shall not be deemed “soliciting material” or “filed” with the SEC, nor shall such information be incorporated by reference into any future filing under the Securities Act of 1933, as amended (the Securities Act) or the Securities Exchange Act of 1934, as amended (the Securities Exchange Act) except to the extent that we specifically incorporate it by reference into such filing. 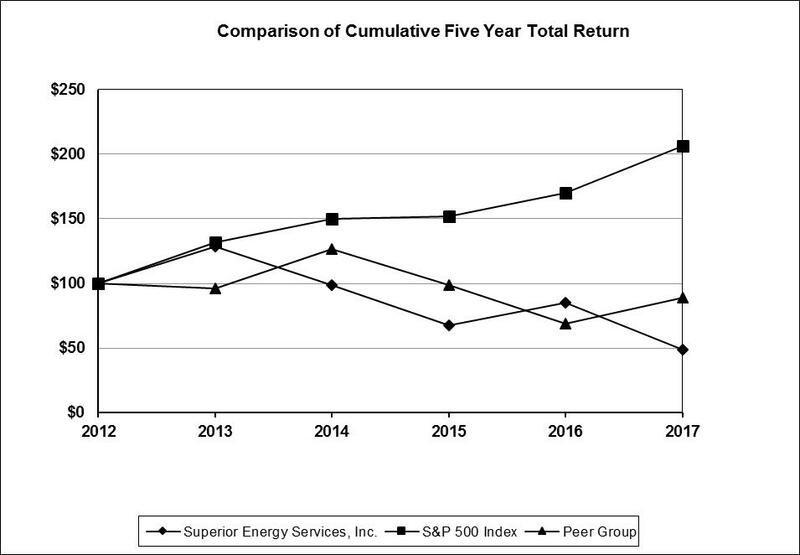 The following graph compares the yearly percentage change in cumulative total stockholder return on our common stock for five years ended December 31, 2017 with the cumulative total return on the Standard & Poor’ 500 Index (S&P 500 Index) and our Self-Determined Peer Group, as described below, for the same period. The information in the graph is based on the assumption of a $100 investment on January 1, 2013 at closing prices on December 31, 2012. The comparisons in the graph are required by the SEC and are not intended to be a forecast or indicative of possible future performance of our common stock. The lines represent monthly index levels derived from compounded daily returns that reflect the reinvestment of all dividends. The indexes are reweighted daily, using the market capitalization on the previous trading day. The index level for all securities was set to $100.00 on December 31, 2012. Our Self-Determined Peer Group consists of 13 companies whose average stockholder return levels comprise part of the performance criteria established by the Compensation Committee of our Board of Directors under our long-term incentive compensation program: Basic Energy Services, Inc., Halliburton Company, Helix Energy Solutions Group, Inc., Helmerich & Payne Inc., Key Energy Services, Inc., Nabors Industries Ltd., National Oilwell Varco, Inc., Oceaneering International, Inc., Oil States International, Inc., Patterson-UTI Energy Inc., RPC, Inc., Schlumberger N.V. and Weatherford International plc. The following discussion should be read in conjunction with our consolidated financial statements and the notes thereto, which are in this Annual Report on Form 10-K.
For 2017, 2016 and 2015, net loss from continuing operations included $14.2 million, $500.4 million and $1,738.9 million, respectively of reduction in value of assets. For 2013, net income from continuing operations included $300.1 million of reduction in value of assets. The following discussion and analysis should be read in conjunction with our consolidated financial statements and applicable notes to our consolidated financial statements and other information included elsewhere in this Annual Report on Form 10-K, including risk factors disclosed in Part I, Item 1A. The following information contains forward-looking statements, which are subject to risks and uncertainties. Should one or more of these risks or uncertainties materialize, our actual results may differ from those expressed or implied by the forward-looking statements. See “Forward-Looking Statements” at the beginning of this Annual Report on Form 10-K.
During 2017, our business began strengthening as commodity prices and the North America rig count improved substantially from the first half of 2016. Average crude oil price increased by 17% during 2017 and U.S. land rig count increased by 76% when compared to 2016. In North America, increased commodity prices and rig counts resulted in a rapidly recovering market during 2017. During the industry downturn, which began in the fourth quarter of 2014, the international markets were more resilient than North America. However, during 2017, our international business experienced activity reductions and pricing pressure. Our Gulf of Mexico business was also negatively impacted by a decrease in offshore rig count and reduced deepwater drilling activity. During 2017, we generated $1,874.1 million of revenue which represents a 29% increase from $1,450.0 million of revenue generated during 2016. The increase in revenue is largely attributable to our U.S. land market area, in which revenue grew by 73% during 2017. The substantial increase in U.S. land market revenue was driven by increases from the majority of our rental and service lines. Most notably, pressure pumping revenue increased 128% during 2017 and accounted for 30% of our consolidated revenue for the year ended December 31, 2017. The increase in the U.S. land revenue was offset by a 17% decrease in revenue from our international market areas and by a 10% decrease in revenue from the Gulf of Mexico market area. These decreases were primarily driven by the declines in both offshore and international activity. For the year ended December 31, 2017, we incurred a net loss of $205.9 million, which represented a $681.0 million or 77% reduction in net loss as compared to 2016. Our general and administrative expenses decreased $51.1 million or 15% during 2017 as compared to 2016. During 2017, we continued to benefit from the steps taken to reduce our cost structure, integrate product and service lines and reorganize certain businesses. During 2017, we made $164.9 million of capital expenditures, an increase of 105% from 2016. Our increased capital expenditures were primarily driven by the significant improvement in the U.S. land market area with the majority of the capital spending used to rebuild our pressure pumping fleet. During 2018, we plan to continue adjusting capital spending to align with market conditions and customer demand. Throughout the downturn and during 2017, our focus has remained on improving working capital and managing our balance sheet to maximize our financial flexibility. During 2017, we issued $500 million of 7 3/4% senior unsecured notes due 2024 and redeemed $500 million of 6 3/8% senior unsecured notes due 2019. We begin 2018 with no debt maturities until 2021. In addition, during 2017, we amended and restated our revolving credit facility to, among other things, extend its maturity to 2022. During 2018, we will focus on generating free cash flow and reducing our outstanding debt. The oil and gas industry is both cyclical and seasonal. The level of spending by oil and gas companies is highly influenced by current and expected demand as well as future prices of oil and natural gas. Changes in spending result in an increased or decreased demand for our services and products. Rig count is an indicator of the level of spending by oil and gas companies. Our financial performance is significantly affected by the rig count in the U.S. land and offshore market areas as well as oil and natural gas prices and worldwide rig count, which are summarized in the table below. The Drilling Products and Services segment is capital intensive with higher operating margins relative to our other segments as a result of relatively low operating expenses. The largest fixed cost is depreciation as there is little labor associated with our drilling products and services businesses. In 2017, 40% of segment revenue was derived from U.S. land market area (up from 22% in 2016), while 31% of segment revenue was from the Gulf of Mexico market area (down from 41% in 2016) and 29% of segment revenue was from international market areas (down from 37% in 2016). Premium drill pipe accounted for more than 55% of this segment’s revenue in 2017, while bottom hole assemblies and accommodations each accounted for approximately 20% of this segment’s revenue in 2017. The Onshore Completion and Workover Services segment consists primarily of services used in the completion and workover of oil and gas wells on land. These services include pressure pumping, well service rigs and fluid management services. All of this segment’s revenue is derived in the U.S. land market areas. Demand for these services in the U.S. land market can change quickly and is highly dependent on the number of oil and natural gas wells drilled and completed. Given the cyclical nature of these drilling and completion activities in the U.S. land market, coupled with the high labor intensity of these services, operating margins can fluctuate widely depending on supply and demand at a given point in the cycle. Pressure pumping is the largest service offering in this segment, representing more than 60% of this segment’s revenue in 2017. Fluid management and well service rigs each accounted for approximately 20% of this segment’s revenue in 2017. The Production Services segment consists of intervention services primarily used to maintain and extend oil and gas production during the life of a producing well. These services are labor intensive and margins fluctuate based on how much capital our customers allocate towards enhancing existing oil and gas production from mature wells. In 2017, 41% of segment revenue was derived from the U.S. land market area (up from 25% in 2016), while 20% of segment revenue was from the Gulf of Mexico market area (down from 24% in 2016) and 39% of this segment’s revenue was from international market areas (down from 51% in 2016). Coiled tubing is the largest service offering in this segment, accounting for approximately 26% of this segment’s revenue in 2017. Hydraulic workover and snubbing represented approximately 19% of this segment’s revenue in 2017, while pressure control and electric wireline each accounted for approximately 14% of this segment’s revenue in 2017.
operating margins in this segment can have significant variations from quarter to quarter. In 2017, revenue derived from the U.S. land market area was 13% of segment revenue (down from 15% in 2016), while 59% of segment revenue was from the Gulf of Mexico market area (up from 55% in 2016) and 28% of segment revenue was from international market areas (down from 30% in 2016). Completion tools and products accounted for approximately 40% of this segment’s revenue in 2017, while well control services represented more than 30% of this segment’s revenue in 2017. Revenue for our Drilling Products and Services segment remained flat at $293.7 million for 2017, as compared to $293.5 million for 2016. Cost of services and rentals as a percentage of revenue decreased to 44% of segment revenue in 2017, as compared to 47% in 2016. Revenue from the Gulf of Mexico market area decreased 24% and revenue from the international market areas decreased 23%. The decline in revenue in these market areas is primarily attributable to decreases in revenues from rentals of premium drill pipe, bottom hole assemblies and accommodation units, primarily driven by a decrease in offshore and international rig counts. The revenue in the U.S. land market area increased primarily as a result of increases in revenues from rentals of premium drill pipe, bottom hole assemblies and accommodation units, as demand for these rental products increased along with the increase in U.S. land rig count. During 2017, we recorded $1.4 million in reduction in value of assets as compared to $48.9 million recorded during 2016. Revenue for our Onshore Completion and Workover Services segment increased 78% to $935.2 million for 2017, as compared to $523.9 million in 2016. All of this segment’s revenue is derived from the U.S. land market area, in which rig count was up 76%. Cost of services and rentals as a percentage of revenue decreased to 85% of segment revenue in 2017, as compared to 98% in 2016, primarily due to improved pricing and efficiencies due to higher activity levels. The increase in revenue is primarily attributable to an increase in activity in our pressure pumping business. During 2017, we recorded $4.7 million in reduction in value of assets as compared to $190.8 million recorded during 2016. Revenue for our Technical Solutions segment decreased 4% to $272.4 million for 2017 as compared to $284.2 million in 2016. Cost of services and rentals as percentage of revenue decreased to 64% in 2017, as compared to 68% in 2016. Revenue derived from the Gulf of Mexico market area increased 3%, primarily due to an increase in demand for completion tools and products and plug and abandonment services, offset by a decrease in subsea intervention activities. Revenue from the U.S. land market area decreased 19% and revenue from international market areas decreased 10% primarily due to a decrease in demand for completion tools and products. During 2017, we recorded $8.1 million in reduction in value of assets as compared to the $25.6 million in reduction in value of assets and $19.1 million inventory write-down charge we recorded during 2016. Other expense for 2017 was $3.3 million as compared to $22.6 million of income for 2016. The decrease in other income is primarily attributable to foreign currency fluctuations. On December 22, 2017, the Tax Cuts and Jobs Act of 2017 (U.S. Tax Reform) was signed into law making significant changes to the Internal Revenue Code. Changes include, but are not limited to, a corporate tax rate decrease from 35% to 21% effective for tax years beginning after December 31, 2017 and the transition of U.S. international taxation from a worldwide tax system to a modified territorial system. As a result, we recorded a provisional income tax benefit of $76.5 million during the fourth quarter of 2017. The provisional amount related primarily to the remeasurement of certain deferred tax assets and liabilities based on the rates at which they are expected to reverse in the future. See note 7 to our consolidated financial statements. Loss from discontinued operations, net of tax, was $18.9 million for 2017 as compared to $53.6 million for 2016. Loss from discontinued operations for 2017 and 2016 included $10.9 million and $33.0 million reduction in value of marine vessels and equipment, respectively. For 2016, our revenue was $1,450.0 million, a decrease of $1,324.6 million or 48%, as compared to 2015. Our performance in 2016 was severely impacted by the significant decrease in land-based activity, particularly in the U.S. land market, where the average rig count decreased 48% as compared to 2015. Supply overcapacity in the U.S. land market remained high for most of 2016, resulting in pricing pressure across all of our services. Net loss from continuing operations was $833.3 million, or a $5.50 loss per share. Net loss was $886.9 million, or a $5.85 loss per share. Included in the results for 2016 were pre-tax charges of $500.4 million related to the reduction in value of assets, $20.8 million for inventory write-down and $39.2 million, primarily, for severance and facility closures. For 2015, our revenue was $2,774.6 million, resulting in a loss from continuing operations of $1,807.8 million, or $12.02 loss per share. Net loss was $1,854.7 million, or $12.33 loss per share. Included in the results for 2015 were pre-tax charges of $1,738.9 million related to the reduction in value of assets and $46.8 million expense for severance and facility closures. The following table compares our operating results for 2016 and 2015 (in thousands). Cost of services and rentals excludes depreciation, depletion, amortization and accretion for each of our business segments. Revenue for our Drilling Products and Services segment decreased 46% to $293.5 million for 2016, as compared to $547.5 million for 2015. Cost of services and rentals as a percentage of revenue increased to 47% of segment revenue in 2016, as compared to 33% in 2015, primarily due to a decrease in revenue. Revenue from our Gulf of Mexico market area decreased 45%, revenue generated in our U.S. land market area decreased 60% and revenue from our international market areas decreased 35%. The decrease in revenue in these market areas was primarily attributable to decreases in revenues from rentals of premium drill pipe, bottom hole assemblies and accommodation units, as demand for these rental products decreased along with the worldwide rig count. During 2016, we recorded $48.9 million in reduction in value of assets as compared to $40.2 million recorded during 2015. Revenue for our Onshore Completion and Workover Services segment decreased 44% to $523.9 million for 2016, as compared to $934.3 million in 2015. All of this segment’s revenue is derived from the U.S. land market area, in which rig count was down 48%. Cost of services and rentals as a percentage of revenue increased to 98% of segment revenue in 2016, as compared to 83% in 2015, primarily due to a decrease in revenue. The decrease in revenue was primarily due to a decline in activity and pricing pressure for our services, primarily in our pressure pumping and fluid management businesses. These services were impacted negatively by reduced customer spending and activity as well as continued pricing pressure in North America during 2016. During 2016, we recorded $190.8 million in reduction in value of assets as compared to $780.2 million recorded during 2015. Revenue for our Production Services segment decreased 56% to $348.4 million for 2016, as compared to $795.2 million in 2015. Cost of services and rentals as a percentage of revenue increased to 79% of segment revenue in 2016, as compared to 77% in 2015. Revenue derived from the Gulf of Mexico market area decreased 41% primarily due to a decrease in electric line activity. Revenue from the U.S. land market area decreased 77%, primarily due to decreased activity in coiled tubing, electric line and slickline services. Revenue from international market areas decreased 43% primarily due to decreased activity from hydraulic workover and snubbing, electric line and coiled tubing services. During 2016, we recorded $235.1 million in reduction in value of assets as compared to $790.5 million recorded during 2015. Revenue for our Technical Solutions segment decreased 43% to $284.2 million for 2016 as compared to $497.6 million in 2015 Cost of services and rentals as percentage of revenue increased to 68% in 2016, as compared to 61% in 2015. Revenue derived from the Gulf of Mexico market area decreased 51%, primarily due to a decrease in demand for well control services and completion tools and products. In addition, the decrease in revenue was also attributable to the discontinuation of our marine technical services business due to the termination of the contract with its customer. Revenue from the U.S. land market area decreased 31% and revenue from international market areas decreased 26% primarily due to a decline in demand for completion tools and products. During 2016, we recorded $25.6 million in reduction in value of assets and $19.1 million inventory write-down charge as compared to $124.9 million reduction in value of long-lived assets recorded during 2015. Depreciation, depletion, amortization and accretion decreased to $510.0 million during 2016 from $612.1 million in 2015. Depreciation and amortization expense decreased for our Drilling Products and Services segment by $26.1 million, or 14%; for our Onshore Completion and Workover Services segment by $16.6 million, or 7%; for our Production Services segment by $41.4 million, or 31%; and for our Technical Solutions segment by $18.6 million, or 30%. Depreciation expense increased for Corporate and Other by $0.6 million, or 9%. The decrease in depreciation, depletion, amortization and accretion is primarily due to lower asset values as a result of the impairments recorded during 2016 and 2015, certain assets being fully depreciated and significantly reduced capital expenditures. General and administrative expenses decreased to $346.6 million during 2016 from $510.7 million in 2015. The decrease was primarily attributable to significant cost reduction initiatives implemented during 2016. These cost reduction initiatives resulted in significantly lower expenses for salaries and wages and other employee-related expenses and insurance and infrastructure-related expenses. Reduction in value of assets in 2016 was $500.4 million as compared to $1,738.9 million in 2015. The reduction in value of assets recorded during 2016 included $190.5 million related to the Production Services segment goodwill impairment and $140.0 million related to the Onshore Completion and Workover Services segment goodwill impairment. In addition, the reduction in value of assets expense included $169.9 million related to reduction in value and retirements of long-lived assets across all of our operating segments. The reduction in value of assets recorded during 2015 included $740.0 million related to the Onshore Completion and Workover Services segment goodwill impairment, $586.7 million related to the Production Services segment goodwill impairment and $412.2 million related to reduction in value and retirements of long-lived assets across all of our operating segments. See note 3 to our consolidated financial statements for further discussion of the reduction in value of assets. Other income for 2016 was $22.6 million as compared to $9.5 million of expense for 2015. The increase in other income was primarily attributable to foreign currency fluctuations. Our effective income tax rate for 2016 was a 24.3% tax benefit compared to a 12.2% tax benefit for 2015. The change in the effective income tax rate was primarily due to the reduction in value of goodwill which is non-deductible for income tax purposes. See note 7 to our consolidated financial statements. Loss from discontinued operations, net of tax, was $53.6 million for 2016 as compared to $47.0 million for 2015. Loss from discontinued operations for 2016 and 2015 included $33.0 million and $34.6 reduction in value of marine vessels and equipment, respectively. During 2017, we generated net cash from operating activities of $103.8 million as compared to $61.3 million in 2016. Our primary liquidity needs during the next twelve months are for working capital and capital expenditures. Our primary sources of liquidity are cash flows from operations and available borrowings under our credit facility. We had cash and cash equivalents of $172.0 million at December 31, 2017 as compared to $187.6 million at December 31, 2016. We made $164.9 million of capital expenditures during 2017. Approximately $27.2 million was used to expand and maintain our Drilling Products and Services segment’s equipment inventory. Approximately $115.4 million was spent on our Onshore Completion and Workover Services segment, primarily to rebuild our pressure pumping fleet. $7.9 million and $13.3 million was spent in our Production Services and Technical Solutions segments, respectively and $1.1 million was spent in Corporate and Other. In October 2017, the Company amended and restated its revolving credit facility to, among other things, extend its maturity to October 2022. The borrowing base under the credit facility is calculated based on a formula referencing the borrower’s and the subsidiary guarantors’ eligible accounts receivable, eligible inventory and eligible premium rental drill pipe, less reserves. Availability under the credit facility is the lesser of (i) the commitments, (ii) the borrowing base and (iii) the highest principal amount permitted to be secured under the indenture governing the 7 1/8% senior unsecured notes due 2021. At December 31, 2017, the borrowing base was $273.3 million and we had $35.3 million of letters of credit outstanding under our revolving credit facility. The borrowing base may increase or decrease as a result of, among other things, changes to the Company’s consolidated tangible assets. The credit agreement contains various covenants, including, but not limited to, limitations on the incurrence of indebtedness, permitted investments, liens on assets, making distributions, transactions with affiliates, merger, consolidations, dispositions of assets and other provisions customary in similar types of agreements. At December 31, 2017, we were in compliance with all such covenants. In August 2017, the Company issued $500 million of 7 3/4% senior unsecured notes due September 2024 in a private placement conducted pursuant to Rule 144A and Regulation S under the Securities Act. Costs associated with the issuance of these notes were $8.9 million which will be amortized over the term of the notes. The Company used the net proceeds of the notes offering and cash on hand to redeem all of the outstanding $500 million 6 3/8% senior unsecured notes due 2019. In connection with the redemption of the senior unsecured notes due May 2019, the Company recorded $2.6 million for the write-off of unamortized debt issuance costs. The indenture governing the 7 3/4% senior unsecured notes due 2024 requires semi-annual interest payments on March 15th and September 15th of each year, beginning on March 15, 2018, through the maturity date of September 15, 2024. The indenture contains customary events of default and requires that we satisfy various covenants. At December 31, 2017, we were in compliance with all such covenants. We also have outstanding $800 million of 7 1/8% senior unsecured notes due 2021. The indenture governing the 7 1/8% senior unsecured notes due 2021 requires semi-annual interest payments on June 15th and December 15th of each year through the maturity date of December 15, 2021. The indenture contains customary events of default and requires that we satisfy various covenants. At December 31, 2017, we were in compliance with all such covenants. The table above reflects only contractual obligations at December 31, 2017 and excludes, among other things, (i) commitments made thereafter, (ii) options to purchase assets, (iii) contingent liabilities, (iv) capital expenditures that we plan, but are not committed, to make and (v) open purchase orders. if different estimates that could have been selected had been used, there could be a material effect on our consolidated results of operations or financial condition. It is management’s view that the current assumptions and other considerations used to estimate amounts reflected in our consolidated financial statements are appropriate. However, actual results can differ significantly from those estimates under different assumptions and conditions. The sections below contain information about our most critical accounting estimates. Long-Lived Assets. We review long-lived assets for impairment whenever events or changes in circumstances indicate that the carrying amount of any such asset may not be recoverable. We record impairment losses on long-lived assets used in operations when the fair value of those assets is less than their respective carrying amount. Fair value is measured, in part, by the estimated cash flows to be generated by those assets. Our cash flow estimates are based upon, among other things, historical results adjusted to reflect our best estimate of future market rates, utilization levels and operating performance. Our estimates of cash flows may differ from actual cash flows due to, among other things, changes in economic conditions or changes in an asset’s operating performance. Assets are generally grouped by subsidiary or division for the impairment testing, which represent the lowest level of identifiable cash flows. Assets to be disposed of are reported at the lower of the carrying amount or fair value less estimated costs to sell. Our estimate of fair value represents our best estimate based on industry trends and reference to market transactions and is subject to variability. The oil and gas industry is cyclical and our estimates of the period over which future cash flows will be generated, as well as the predictability of these cash flows, can have a significant impact on the carrying value of these assets and, in periods of prolonged down cycles, may result in impairment charges. Goodwill. In assessing the recoverability of goodwill, we make assumptions regarding estimated future cash flows and other factors to determine the fair value of the respective assets. We test goodwill for impairment in accordance with authoritative guidance related to goodwill and other intangibles, which requires that goodwill, as well as other intangible assets with indefinite lives, not be amortized but instead be tested annually for impairment or when changes in circumstances indicate that the carrying value may not be recoverable. Our annual testing of goodwill is based on carrying value and our estimate of fair value as of October 1. We estimate the fair value of each of our reporting units (which are consistent with our business segments) using various cash flow and earnings projections discounted at a rate estimated to approximate the reporting units’ weighted average cost of capital. We then compare these fair value estimates to the carrying value of our reporting units. If the fair value of the reporting unit exceeds the carrying amount, no impairment loss is recognized. If the estimated fair value of the reporting unit is below the carrying value, then an impairment is recorded which represents the amount by which a reporting unit’s carrying value exceeds its fair value. We use all available information to estimate fair values of the reporting units, including discounted cash flows. Our estimates of the fair value of these reporting units represent our best estimates based on industry trends and reference to market transactions. A significant amount of judgment is involved in performing these evaluations since the results are based on estimated future events. Based on the most recent goodwill impairment test at October 1, 2017, the fair values of the Drilling Products and Services, Onshore Completion and Workover Services and Production Services segments were substantially in excess of their carrying values. Therefore, no goodwill impairment was recorded. Income Taxes. We use the asset and liability method of accounting for income taxes. This method takes into account the differences between financial statement treatment and tax treatment of certain transactions. Deferred tax assets and liabilities are recognized for the future tax consequences attributable to differences between the financial statement carrying amounts of existing assets and liabilities and their respective tax bases. Deferred tax assets and liabilities are measured using enacted tax rates expected to apply to taxable income in the years in which those temporary differences are expected to be recovered or settled. Our deferred tax calculation requires us to make certain estimates about our future operations. Changes in state, federal and foreign tax laws, as well as changes in our financial condition or the carrying value of existing assets and liabilities, could affect these estimates. The effect of a change in tax rates is recognized as income or expense in the period that the rate is enacted. On December 22, 2017, U.S. Tax Reform was signed into law making significant changes to the Internal Revenue Code. Changes include, but are not limited to, a corporate tax rate decrease from 35% to 21% effective for tax years beginning after December 31, 2017 and the transition of U.S. international taxation from a worldwide tax system to a modified territorial system. As a result, we recorded a provisional income tax benefit of $76.5 million during the fourth quarter of 2017. The provisional amount related primarily to the remeasurement of certain deferred tax assets and liabilities and was based on the rates at which they are expected to reverse in the future. Our deferred tax assets and liabilities may change with further analysis. Any subsequent adjustments to the provisional amount will be reported as component of income tax expense (benefit) in the reporting period in which any such adjustments are determined. See note 7 to our consolidated financial statements. Revenue Recognition. Our products and services are generally sold based upon purchase orders or contracts with customers that include fixed or determinable prices. We recognize revenue when services or equipment are provided and collectability is reasonably assured. We contract for a majority of our services on a day rate basis. We rent products on a day rate basis, and revenue from the sale of equipment is recognized when the title to the equipment has transferred to the customer. At December 31, 2017, we had no off-balance sheet arrangements and no hedging contracts. We are exposed to market risks associated with foreign currency fluctuations and changes in interest rates. A discussion of our market risk exposure in financial instruments follows. Because we operate in a number of countries throughout the world, we conduct a portion of our business in currencies other than the U.S. dollar. The functional currency for our international operations, other than certain operations in the United Kingdom and Europe, is the U.S. dollar, but a portion of the revenues from our international operations is paid in foreign currencies. The effects of foreign currency fluctuations are partly mitigated because local expenses of such international operations are also generally denominated in the same currency. We continually monitor the currency exchange risks associated with all contracts not denominated in the U.S. dollar. Assets and liabilities of certain subsidiaries in the United Kingdom and Europe are translated at end of period exchange rates, while income and expenses are translated at average rates for the period. Translation gains and losses are reported as the foreign currency translation component of accumulated other comprehensive loss in stockholders’ equity. We do not hold derivatives for trading purposes or use derivatives with complex features. When we believe prudent, we enter into forward foreign exchange contracts to hedge the impact of foreign currency fluctuations. We do not enter into forward foreign exchange contracts for trading purposes. At December 31, 2017, we had no outstanding foreign currency forward contracts. At December 31, 2017, we had no variable rate debt outstanding. Our revenues, profitability and future rate of growth significantly depend upon the market prices of oil and natural gas. Lower prices may also reduce the amount of oil and gas that can economically be produced. For additional information on the impact of changes in commodities prices on our business and prospects, see Item 1A to this Annual Report on Form 10-K.
We have audited the accompanying consolidated balance sheets of Superior Energy Services, Inc. and subsidiaries (“the Company”) as of December 31, 2017 and 2016, the related consolidated statements of operations, comprehensive loss, changes in stockholders’ equity, and cash flows for each of the years in the three‑year period ended December 31, 2017, the related notes and financial statement schedule as listed in the accompanying index (collectively, the “consolidated financial statements”). In our opinion, the consolidated financial statements present fairly, in all material respects, the financial position of the Company as of December 31, 2017 and 2016, and the results of its operations and its cash flows for each of the years in the three‑year period ended December 31, 2017, in conformity with U.S. generally accepted accounting principles. We also have audited, in accordance with the standards of the Public Company Accounting Oversight Board (United States) (PCAOB), the Company’s internal control over financial reporting as of December 31, 2017, based on criteria established in Internal Control – Integrated Framework (2013) issued by the Committee of Sponsoring Organizations of the Treadway Commission, and our report dated February 22, 2018 expressed an unqualified opinion on the effectiveness of the Company’s internal control over financial reporting.